Experience the Country’s #1 Beach! Close your eyes and imagine the powdery-white sand in between your toes, the Gulf's perfectly clear aqua warm waters gently lapping up onto the shore and the bright sun warming your skin. Siesta Public Beach is renowned for its breath-taking sunsets, easy-going waves, and gorgeous, crystal-white sand. There is a jungle gym and swings for the kids and public tennis courts. If you would like to get away from most of the crowds, try Crescent Beach. It’s a little bit more secluded and it still offers the amazing sand and azure waters. At the southern tip of Siesta Key is Turtle Beach, it’s a sportier, “family play” beach experience. This beach offers picnic areas, a playground, volleyball court, and horseshoe pit. There’s also a boat launch and fishing is permitted in the nearby Blind Pass Lagoon. The sand on the beach tends to have more shells, making it perfect for beachcombers and shell collectors. Many find petrified sharks’ teeth to take home and treasure. The center of the Siesta Key is called “the village.” It’s packed full of restaurants and gift shops. It’s the perfect place to sip on a tropical drink or enjoy an ice cream cone while watching people pass by. Live music and delicious seafood, all in walking distance of the beach and many Siesta Key hotels. When the sun sets, the restaurants transition to fun-filled nightlife arenas. For an up to date list of all events in our area, please visit our Events page. Up, Up, and Away! No experience required. Strap in to get ready and glide effortlessly, slowly and safely into the sky while cruising the coast of siesta beach. It's the view of the lifetime! You'll get a gentle, dry takeoff and landing from the platform on the custom parasail-boat. 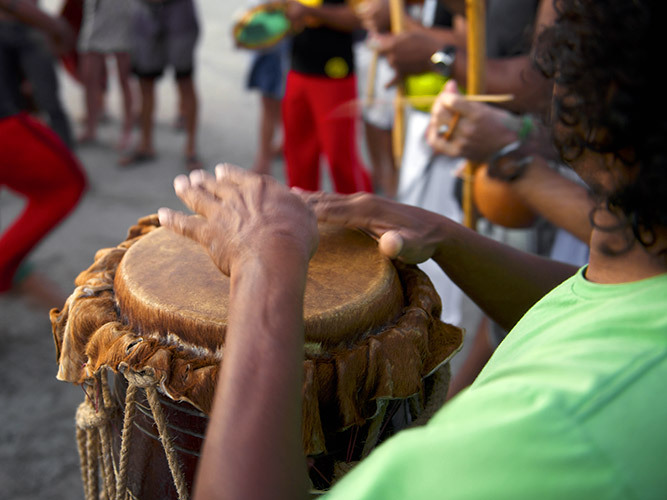 Every Sunday before sunset, sit and watch (or join in) as the crowd of drummers shares a continuous beat. Dancers, acrobats and kids all move to the music. Visitors come from around the world to relax, beat their drum, watch the sunset and enjoy the unique characters. Check out some of the hot spots in Siesta Key. If you need a white, sandy beach, a cold beverage, or something to make the kids happy, read on! A whole world of adventure is waiting for you! Siesta Key Oyster Bar - S.K.O.B. World-class shopping is just around the corner! Unwind at one of Siesta's after-dark hotspots.